Highly reflective textured aluminum insert for excellent output, uniformity and diffusion. Compact unit has a low profile making it great for Small spaces such as tents as well as larger growing areas. Dual power inputs easily switch voltage from 120 to 240 volt power. Sun System offers a 2 Year Warranty on the fixture. 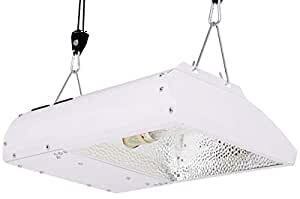 Sun System Flower power 315W light fixtures utilize cutting edge Light Emitting Ceramic brand technology. Fixture has a 95% reflective textured aluminum insert for excellent output, uniformity & diffusion. This compact unit has a low profile making it great for small spaces such as tents as well as larger growing areas. Dual power inputs easily switch voltage from 120 to 240V power. Simply unplug detachable 8′ 120V power cord (included), & turn power plate around for 240V power & plug in a 240V power cord (240V power cord sold separately #903082). #906216 & #906297 includes PAR pro LEC 315W lamp. These lamps produce a clean White light. 3, 100Â°k color temperature, excellent 92.6 CRI. 37, 913 initial lumens. The 3, 100Â°k has a very high 1.82 ppfdper S light source. 4, 200Â°k color temperature, excellent 97.5 CRI, 31, 127 initial lumens. The 4, 200Â°k has very high 1.70 ppfdper S light source. Good Lm maintenance & excellent PPF performance throughout lamp life. Unique open-rated lamp construction, including a ceramic arc tube contained in a protective Quartz glass shroud with PGZX18 base, reduces radiant heat from the arc tube & makes this suitable for open rated fixture use. Includes hangers for hanging The fixture securely. One year warranty on the lamp.